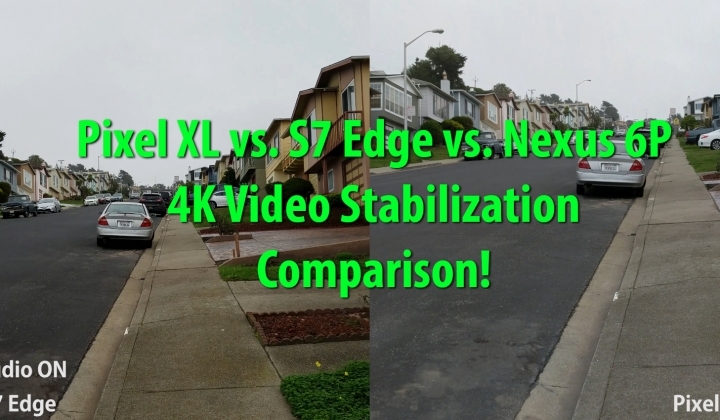 Pixel XL vs S7 Edge vs Nexus 6P 4K Camera Video Stabilization Comparison! Here’s a quick 4K camera video stabilization comparison between the new Google Pixel XL vs. Galaxy S7 Edge vs. Nexus 6P. I am actually impressed at how well the Gyro EIS on Pixel XL did, WOW. Although Pixel XL had some stutter issues when moving the phone in an aggressive way, overall the Pixel XL had much better stabilization than the Galaxy S7 Edge, which I feel like “was” the king of 4K video stabilization. In real life usage, I think the stabilization on Pixel XL will work better so long as there are no jerky movements in your video shooting. And since Nexus 6P does not have any form of stabilization when recording in 4K, the results are just obvious but it shows how much the Pixel has improved over last year’s Nexus 6P so if you shoot a lot of videos than photos, the Pixel or Pixel XL may be a great upgrade. Also see Pixel XL vs. Nexus 6P Camera Low-Light Comparison if you haven’t yet. Next story Pixel XL vs Pixel vs Nexus 6P Camera Low Light Comparison! Previous story Pixel XL vs Nexus 6P Camera Low-Light Comparison!